Internationally renowned actor, singer and entertainer Robert Goulet returns to Theatre Under the Stars as King Arthur in Camelot, the hit musical by Alan Jay Lerner and Frederick Loewe, July 21 - August 2, at the Wortham Theater Center, Brown Theater. Mr. Goulet previously performed this memorable role for TUTS in 1990 shattering all previous box office records and thrilling audiences with his extraordinary voice and exceptional performance. The production also stars Patricia Kies as Guenevere, Burke Moses as Lancelot, James Valentine as Merlyn and Michael Goulet as Mordred. Camelot is directed and choreographed by Norb Joerder, with scenic design by Duncan Edwards. John Visser serves as musical director and conductor. The final collaboration of Lerner (book and lyrics) and Loewe's (music) illustrious 18 year partnership, Camelot's Broadway debut was a stunning success. With the collaborative efforts of director Moss Hart, the show won four 1960 Tony Awards and enjoyed 25 months on Broadway, after which it was mounted in London and Australia. 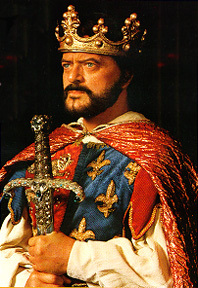 It starred Richard Burton as King Arthur, Julie Andrews as Guenevere and Robert Goulet as Lancelot. The show is peppered with some of Lerner and Loewe's most glorious music, including "Camelot", "What Do theSimple Folk Do? ", "How to Handle a Woman", "If Ever I Would Leave You", and "I Loved You Once in Silence." Based on the novel "The Once and Future King" by T.H. White, Camelot is the tale of wizardry, romance and chivalry; the story of good King Arthur, ruler of the utopian kingdom famed for its Round Table of noble knights who promote goodness, gentility and "might for right" as they battle evil and injustice. Guided by the benevolent wizard Merlyn, Arthur and his queen, Guenevere, welcome to Camelot the French knight Lancelot, who becomes his trusted friend. When life is brightest, however, Arthur sees his dream of utopia dashed by the schemes of his evil son, Mordred. They were all shouting, "Long Live the King! Long Live the King!" 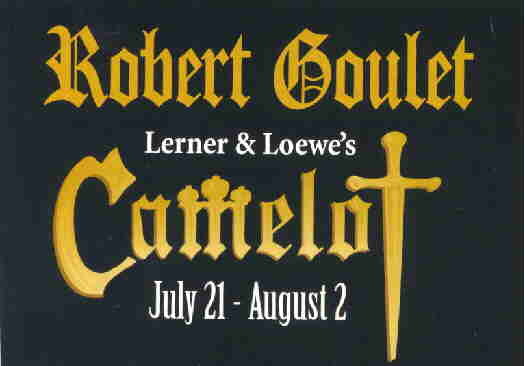 When Robert Goulet made his Broadway debut as Lancelot in Camelot in 1960, he achieved instant recognition as one of the American Theater's most charismatic and talented musical stars and received the Theatre World Award for his performance. Preceded by an already well-established career in Canada, his New York bow was followed by a stunning array of more than 60 best selling albums, international concert appearances, motion pictures and television specials. A theater veteran, his many stage credits include Carousel, Dreamgirls, Finian's Rainbow, Gentlemen Prefer Blondes, I Do! I Do!, Kiss Me Kate, Meet Me in St. Louis, On a Clear Day, South Pacific, The Happy Time, The Pajama Game and the Fantasticks. 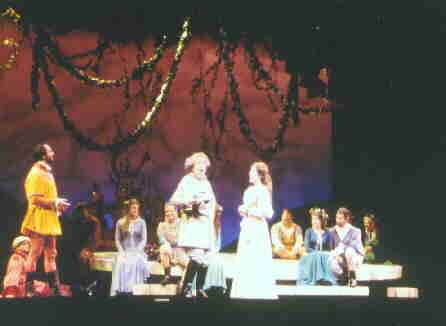 Mr. Goulet was most recently seen on national tour in TUTS' production of Man of La Mancha in 1997-98. Mr. Goulet's television credits include appearances on "Police Story", "Get Smart", "Fantasy Island", "In the Heat of the Night" and "The Simpsons", as well as his own specials. Film projects range from the animated feature film Gay Purr-ee, co-starring the voice of Judy Garland, to Honeymoon Hotel, I'd Rather be Rich, Atlantic City, Beetlejuice, Scrooged, Naked Gun 2 1/2, and Mr. Wrong. His ESPN college basketball commercials brought him an influx of Generation X fans and earned the 1996-97 campaign an Emmy award for Best Promotional Spot in Sports. And his current commercial for Mercedes has delighted both older fans and new fans alike. 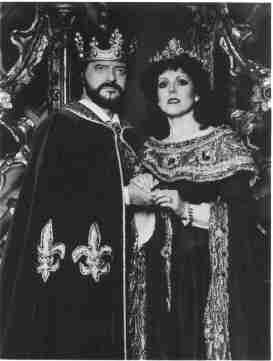 Robert Goulet is the legendary King Arthur and Patricia Kies, his Guenevere in CAMELOT at the Brown Theater of Wortham Center. Patricia Kies returns to Theatre Under the Stars, having previously appeared here as Maria in The Sound of Music with Harve Presnell and most recently as Guenevere in Camelot with Robert Goulet in 1990. She appeared in the recent national tour and 1993 Broadway revival of Camelot starring Robert Goulet. She has appeared as Eliza in My Fair Lady, Anna in The King and I, Kate in Kiss Me Kate, Agnes in I Do! I Do!, Sister Mary Amnesia in Nunsense and The Widow in The Merry Widow. Non-musical credits include Truvy in Steele Magnolias, Jenny in Chapter Two, Steffy In I Ought to Be In Pictures and Eleanor in The Lion in Winter. She made her directorial debut in 1996 with a production of Catch Me If You Can. Sky Masterson in the smash hit revival of Guys and Dolls. Other New York Theatre credits include Way of the World, New York Shakespeare Festival, Most Happy Fella, New York City Opera, and Lil' Abner and Dubarry Was a Lady, City Center's Encore! Series. In addition to numerous regional theatre credits, he has also appeared on television in "The Nanny", "3rd Rock from the Sun," "The Client", "Cybil", "Caroline in the City", as well as regular appearances on "Loving", "As the World Turns", and "One Life to Live." He has just completed a pilot, "In The Loop", for ABC Television. Pellinore (James Valentine) provide comedy relief as Guenevere (Patricia Kies) and the lords and ladies of Camelot look on. James Valentine also returns to TUTS, reprising the role of Merlyn which he performed in 1990 with Robert Goulet and Patricia Keis. Mr. Valentine performed the roles of Merlyn and Pellinore in numerous Camelot productions beginning in 1980 with Richard Burton and continuing with Richard Harris, then with Robert Goulet in the most recent national tour and Broadway revival in 1993. He was Colonel Pickering in a national tour of My Fair Lady starring John Neville, and he was featured in the 30th Anniversary Tour of The Fantasticks as the Old Actor. He appeared on Broadway in Alice in Wonderland, The Importance of Being Ernest, Caesar and Cleopatra, Beyond the Fringe, Ross, Epitaph for George Dillon, Duel of Angels and Cloud Seven. 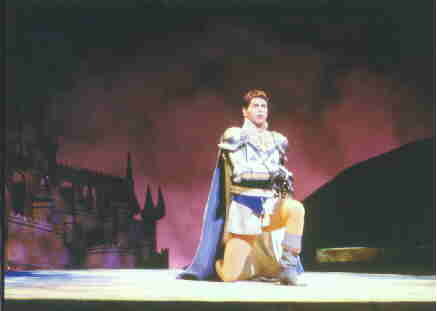 Michael Goulet makes his TUTS debut in this production of Camelot. One of Robert Goulet's three children, Michael has been performing professionally since the age of seventeen in stage productions and musical groups including national tours of Camelot, South Pacific and Man of La Mancha. Among his favorite roles are Lancelot in Camelot and Frank Butler in Annie Get Your Gun. Director / Choreographer Norb Joerder, who directed TUTS' 1990 production of Camelot, has been associated with various productions of this Lerner & Loewe classic, from the Richard Burton revival in 1980, through the Richard Harris Broadway, National and International tours which he staged and choreographed, as well as the most recent national tour and 1993 Broadway revival starring Robert Goulet. He recently received the Carbonell Award for his direction and choreographic work at the Jupiter Theatre in South Florida. He had remounted productions of La Cage Aux Folles with Gene Barry, 42nd Street with Tammy Grimes and Jerry Orbach, Music Man with John Davidson and South Pacific with Robert Goulet. Tickets for Camelot range from $15 to $75, with reduced price previews Tuesday and Wednesday July 21 and 22. Tickets are available via telephone at 800-678-5440 or at TUTS Box Office at Corporate Square I, 2600 Southwest Freeway (off Kirby) or Wortham Theatre Ticket Center (Prairie at Smith). For other ticket outlet locations, call 888-FIND-TIX. For Group Discounts (party of 15 or more), call David Greiss at 713-558-2600, ext. 4052.